Ancient Egypt theme was extremely popular in the days when people gone to real casinos to play slots, both with the times of web casinos. And, if you follow the trends of popularity among players and developers, it will not lose its gaming relevance in the future, while web casinos are becoming more confident for Bitcoin slots. Constantly there are more and more games that are very often fresh and innovative products. One of them is Pyramid Bitcoin slot released in late 2015 by world-famous developer of gambling software NetEnt. Let’s try to understand more below, what this slot is special and worthy of your attention. 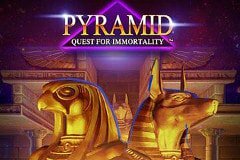 Pyramid interface is made in traditional Ancient Egypt visuals, taking into account all the actual pop-culture attributes of this civilization. In general, composition of buttons and other functional elements is typical here as for almost all NetEnt projects, and it will be simple to understand here both the fan of the slots, and the complete beginner. There are some Ancient Egypt landscapes and the statues of gods on the background, and a big playing field in the center of the screen, that occupies almost all space. Also you can find a button with detailed info about the game on the far left. Turning to design question, it is truly simple and concise form, which combines the mandatory game practicality with the authenticity of the game theme (additional elements that create the atmosphere). Color gamut is clear and bright, sufficiently contrasting colors are chosen for game processes clarity. The pyramid has an original gaming structure. There is no traditional system of lines and reels, and game plates are piled down from the top. So you can collect different winning combos. If there are plates with winning combos, they disappear, and new plates come from above to the current game configuration with no other changes. If the winning combination is again collected, more plates arrive, and the points of all wins are multiplied with a certain coefficient. The more winnings in a row, the more multipliers, and you can earn a lot. Game plates are made, naturally, in accordance with the markers of Ancient Egypt: gods, scarabs, cobra, etc. The playing field of non-standard form consists of columns with 3-5-7-5-3 plates respectively. The combination of columns of a game field gives 720 winning options, which makes the game machine highly attractive from a financial point of view. Now imagine that you can increase the rate by 36,000 times (maximum). NetEnd removed for the sake of keeping balance the chance to win free spins here, but it does not affect the game interest. Strangely enough, this is the first NetEnt game in Ancient Egypt style. And we have hit the bull’s eye immediately with fine gaming benefits and the total gameplay convenience. A lot of genre analogues will now simply go into shadow, despite the non-standard Pyramid’s gameplay. It is unusual only the first few bets, and then does not let you break away from, for example, Bitcoin play. Chose best bitcoin casino for Pyramid slot on our website!